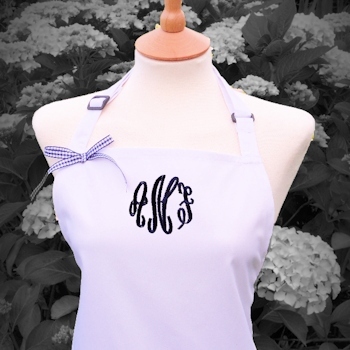 A fancy circle swirl monogram with up to 3 initials embroidered onto a white chefs apron in navy blue with a gingham grosgrain ribbon to match! Bespoke embroidery of each apron especially to order with a single, double or triple initials monogrammed in our fancy script. Bespoke embroidery of each apron especially to order with a single, double or triple initials monogrammed in our fancy script. A single letter will be sewn as a large swirl monogram. Double letters will each be in large swirl monogram side by side. Triple letters will be in the circular shaped swirl monogram as displayed in our sample picture. Great for light to heavy duty cooking, professional catering and chefs, or barbeques and the domestic goddess! Measures approx 70cm wide x 90cm long.